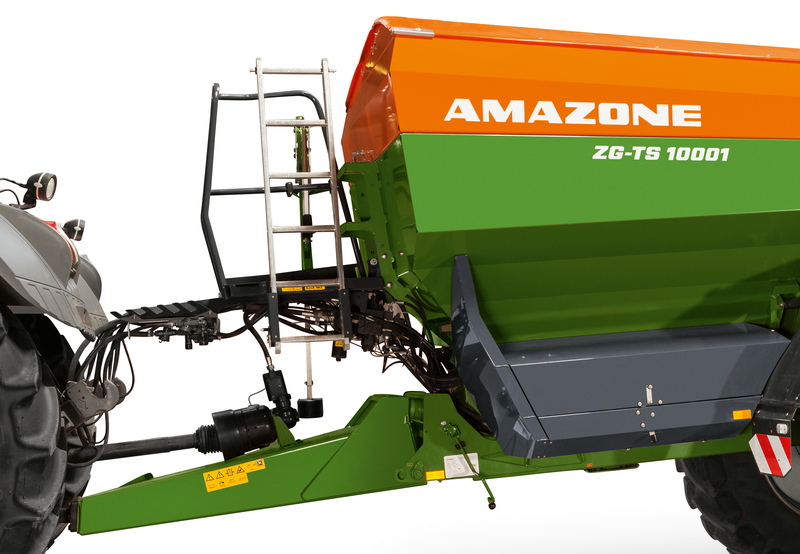 WITH its 10,000 litre hopper, a working width of up to 54 metres and an operating speed of up to 30 km/h, the new AMAZONE ZG-TS 10001 trailed spreader sets new benchmarks for high capacity precision spreading. It is equipped with a host of cutting-edge technology, three automatic spreading pattern adjustment systems, automatic calibration, load-dependent electronic braking, hydraulically self-steering and an aperture blockage monitoring system. The top-of-the-line ProfisPro configuration features an onboard weighing system that automatically regulates the application rate. “Four weigh cells positioned between the hopper frame and chassis constantly monitor the amount of fertiliser being discharged,” Blair says. “This data is used to adjust the metering shutter slides, as well as the intelligent fill-level management system. “By constantly measuring how much fertiliser remains in the hopper, the weighing system can determine how much fertiliser is required to complete the job. 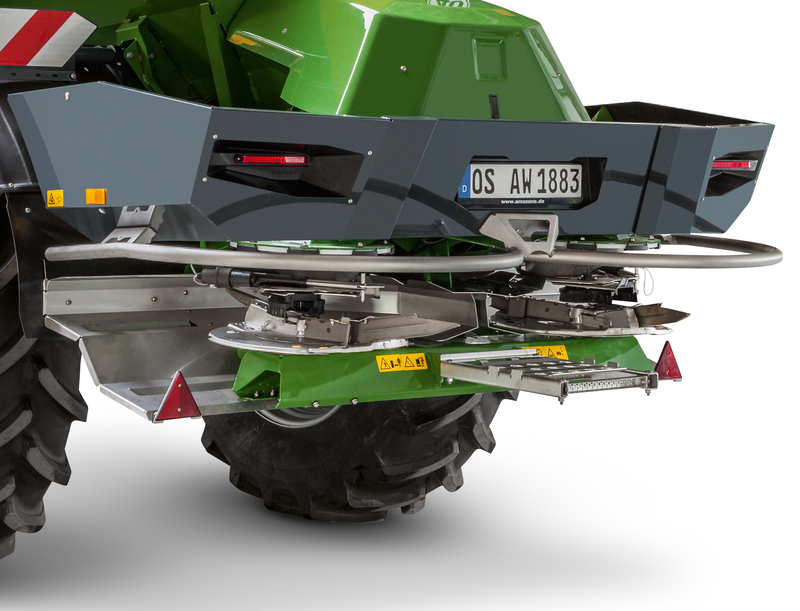 “This avoids unnecessary travelling in the field with a half-full spreader.” The ZG-TS 10001 also boasts the new ArgusTwin and WindControl spreading pattern adjustment systems and FlowCheck aperture blockage monitoring system released at Agritechnica last year. “The vane kits can be quickly and simply changed, while the AutoTS system allows the spreader to switch seamlessly from normal to broad spreading without the need to change discs”. Optional DynamicSpread part-width section control technology offers the possibility to switch up to 128 part-width sections in wedge-shaped fields. The sharp hopper profile provides sufficient room for the same automatic steering system found on AMAZONE’s UX trailed sprayers. “The 28 degree pivot angle means the 10001 is capable of true-track steering, even with a track width of 1.8 m and a tyre width of 520 mm,” Blair says. 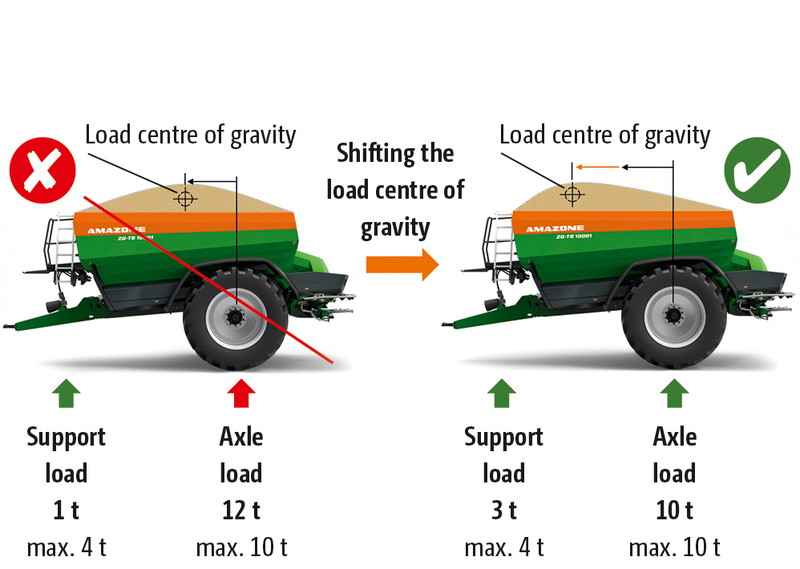 “The spreader follows exactly the same path as the tractor – and exactly the same path as previous or subsequent spraying operations, minimising crop damage and soil compaction.” The steering system automatically switches off once the spreading disc drive is deactivated or ground speed exceeds 25 km/h. The steering system, spreading discs and floor belt are powered and controlled via a standard tractor-based load-sensing hydraulic system or a new hybrid system. The hopper design also ensures correct weight distribution across the drawbar and axle. A double-acting spool valve allows the hopper cover to be quickly rolled back or forth from the tractor cab. The leaf springs within the canvas ensure the cover stretches tightly over the hopper to provide weatherproof seal. The load-dependent electronic braking system permits safe road transport at up to 60 km/h. “The weighing system constantly measure the amount of fertiliser inside the hopper and automatically adjusts the braking force,” Blair says. “The weighing system also shows how much load is resting on the axle and how much on the drawbar at any time. 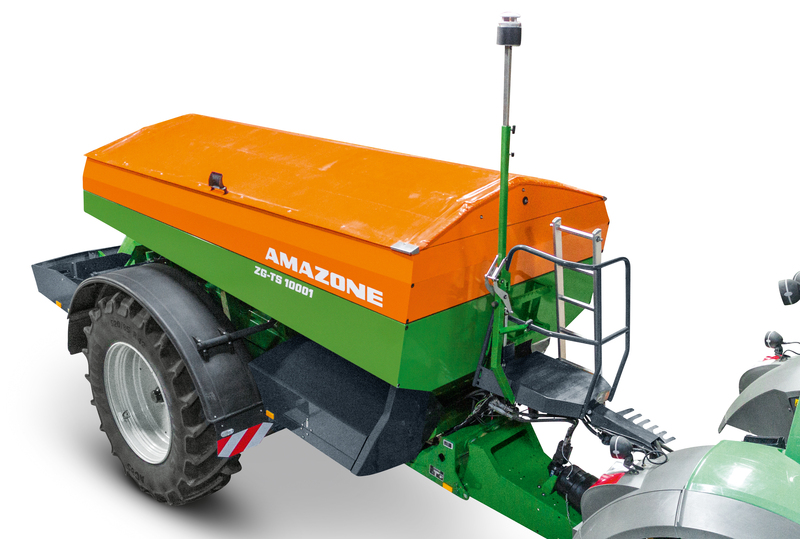 “This avoids subjective misjudgements and ensures legal travel in accordance with road traffic regulations.” AMAZONE farm machinery is distributed in New Zealand by the CLAAS Harvest Centre network.